The Setacolor Opaque boxed set of 10 assorted opaque colors (45ml bottles) includes all the paint needed to paint almost any fabric piece that is desired. The set is perfect for gift giving or to begin the activity of fabric painting, as it includes the 10 most popular colors. The selection of paints includes enough paint to complete a large number of handpainted pieces. This is the perfect set for someone who simply wants to create several pieces and wishes to have a wide selection of paint on hand. 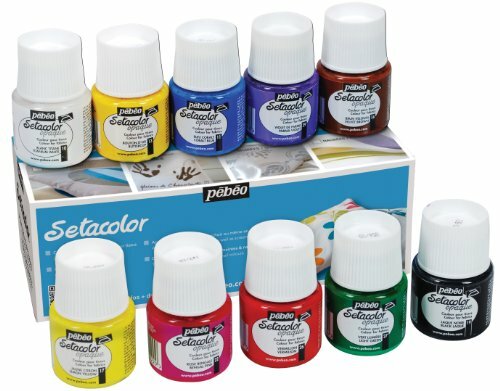 Ready to use, intense and concentrated, the Setacolor Opaque colors are used pure or diluted with water to obtain watercolour effects and are suitable for various techniques. Vivid and bright, the Setacolor Opaque colours have an exceptional covering power to decorate both dark or light coloured fabrics. Their rich texture is especially suited for brush work, stencil work and even silkscreen printing. Once applied, simply "set" the paints with an iron or in a kitchen oven. Once fixed, the designs resist machine washing and dry cleaning. Conforms to ASTM D-4236. View More In Fabric Decorating. If you have any questions about this product by Pebeo, contact us by completing and submitting the form below. If you are looking for a specif part number, please include it with your message.